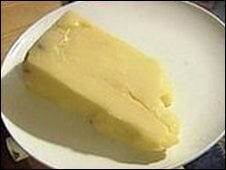 A supermarket has apologised to one of its customers after she was told she could not have unpasteurised Cheddar cheese because she was pregnant. Janet Lehain, 31, asked for the mature cheese at the deli counter in a Sainsbury's store in Bedford last week. But Ms Lehain's server told her she should have another type of Cheddar. In a letter of complaint, she described it as "the most patronising encounter I have had the misfortune of experiencing in a long time". She said she only succeeded in persuading the member of staff at the Fairfield Park store to sell her the cheese by promising not to eat any of it herself. "I was very surprised," the mother-of-two said. "She went beyond telling me it was unpasteurised and insisted I should have a different type of Cheddar." In her letter of complaint, Ms Lehain pointed out that the warning to pregnant women about unpasteurised cheese relates especially to the first three months of pregnancy. "It's the nanny state gone crazy. Someone in Sainsbury's is not a medical expert and so is not qualified to start handing out medical advice." Sainsbury's said it did not have a policy of refusing sale of goods on the grounds that they might be unsuitable for pregnant women. But it said it did ask staff to make customers aware of any safety concerns. A spokesman said: "We apologise to the customer for any offence caused. "In this case, our colleague made a mistake - unpasteurised Cheddar does not pose a risk to health during pregnancy."